This will be the first in a series of blog posts that target those new to both Python and programming. 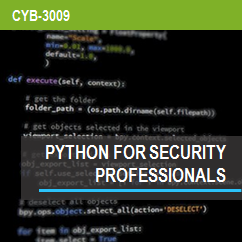 Python is a very powerful scripting language because of the support it has in the InfoSec community. This support means many tools are written in Python, and there are many modules that can be leveraged in scripts. Modules offer functionality that can be imported into a script to accomplish complex tasks in a few lines of code. This blog post will assume you are using a Linux OS and using Python version 2.x. When writing Python code you can either type it directly into a Python interpreter or store it in a file. Many find it very helpful to write their code directly into a Python interpreter and work out the logic and syntax prior to saving it to a file. Keep in mind that Python enforces the use of indentation which you’ll run into with declaring functions, loops, if/else statements, etc. Since the variable “IP” was already a string there was no need to cast it as we did with the “port” variable. Now that you have seen two basic data types (String, and Integer) you can explore what different built-in functions are available to interact with that data type. Practice these concepts in a Python interpreter to solidify them because they will be leveraged in more complex examples in future tutorials. When developing code I like to have two terminals up parallel to each one, one to type directly into a Python interpreter, and the other to pull the logic over into a script. The next tutorial goes over coding in an actual Python script, definitions, classes, and the sys module. This quick snippet of code exploits CVE-2012-3152 Oracle Reports Local File Inclusion (LFI) vulnerability. To more easily interact with the vulnerable system the HTTP request exploiting the LFI is wrapped in an endless loop that feels like a command prompt.